Sometimes you get a call for a project that you know is going to be a challenge – so much so that every ounce of your professional experience is telling you that you should politely decline the opportunity. And most of the time you might end up saying no. After all, you care about the quality of your work and wouldn’t want a poorly executed project to sully your otherwise solid professional reputation. But sometimes the project is just too enticing to say no to – even if the parameters in which the work has to be completed are going to present significant challenges. That’s the situation we found ourselves in when Team Tioga came to us and told us they wanted to do something special – something attention-grabbing – for the pitch they were doing as part of an effort to land a $10 million state grant. Governor Cuomo had pledged $100 million in funds, to be made available to towns and cities throughout the state and competition was tough. Owego knew they were a serious underdog in this fight – but they also knew that they were one of six finalists for our region. (only three finalists would actually get to present, and they did not know if they would be one of the three when they hired us). 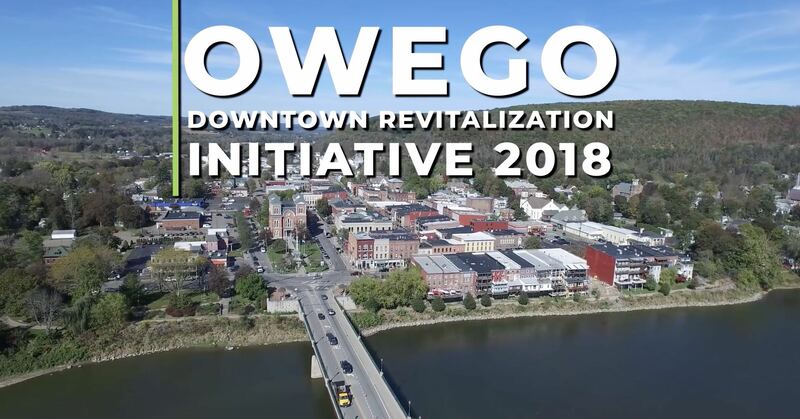 Doing a project for the Town of Owego and for the Office of Economic Development sounded right up our alley – but when we heard that we’d have zero time for pre-production and minimal time for editing and final output, we had a moment where we wondered if this was going to be a good idea. We had proposed a highly ambitious concept, where we would create a 15-minute video (the maximum length of the presentation), with some of the video showcasing the stories of Owego residents, and other parts of the video would be silent b-roll where the person who was giving the presentation – Owego Director of Tourism Becca Maffei – would present those parts of the script “live”. The week before the presentation we went into a frenzy of production, working in close collaboration with Team Tioga, who were also all-in, working 24/7 to hone their presentation. Shooting all took place during one very long but very amazing day. The stories were inspirational, real and moving. It didn’t rain (much). It was exhausting and exhilarating, doing what we know we’re good at – but oh, how fast and furious we had to work to meet this crazy deadline. And keep in mind, no one knew if Owego was actually going to get a chance to present. We finished shooting and started editing, but then, on the Friday before the presentation we got the call we never wanted to get. Information was not freely available, per the rules of the competition, but according to someone “in the know” it seemed clear that Owego was NOT going to be one of the final three. We were all crushed, but did our best to put on a brave face and discuss how the footage could be used for other purposes with economic development and tourism. The whole thing wouldn’t have been a total waste of time, but still it was disappointing. We all agreed to put the project on ice for the weekend and to regroup on Monday. We weren’t allowed to be in the room with the judges but we heard that the whole thing went off without a hitch. Becca delivered her parts beautifully and the videos we shot and recorded helped to tell the story of the town and its residents. Weeks later we got the word that Owego had, in fact, won the grant and that Governor Cuomo would be coming to town to deliver the check. It was a perfect end to a crazy but effective story that truly does demonstrate the power of video! I hope you enjoy watching the above video, and believe you’ll quickly see why they did deserve to win these funds! !